A BASIC Stamp is an essentially complete, self-contained computer system for use in electronic circuits. Although you can purchase a BASIC Stamp microcontroller by itself, the easiest way to get into BASIC Stamp programming is to purchase a starter kit. The BASIC Stamp starter kit includes a BASIC Stamp along with the software that runs on your PC for programming the BASIC Stamp and the USB cable that connects your PC to the Stamp. In addition, most starter kits come with a prototype board that makes it easy to design and test simple circuits that interface with the Stamp. BASIC Stamp HomeWork board: This is a prototyping board that includes a BASIC Stamp 2 microcontroller, a small solderless breadboard, a clip for a 9 V battery, and a connector for the USB programming cable. USB cable: Connect the HomeWork board to a computer so that you can program the Stamp. A handful of useful electronic components: Use these components for building circuits that connect to the Stamp, such as resistors, LEDs, capacitors, a seven-segment display, some pushbuttons and a potentiometer, and plenty of jumper wires. Servo: This is a fancy motor that the Stamp can control. 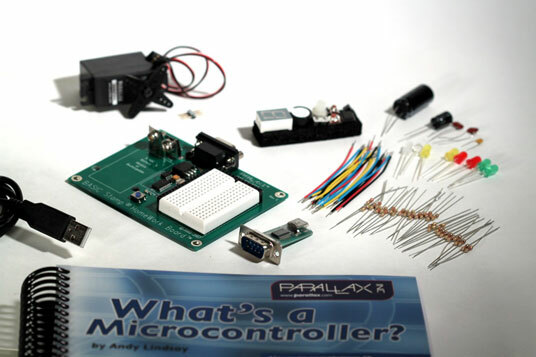 What’s a Microcontroller? : This booklet included with the BASIC Stamp starter kit gives a nice detailed overview of programming the BASIC Stamp II.